2) a complete making-off commented ( with text label over video ). 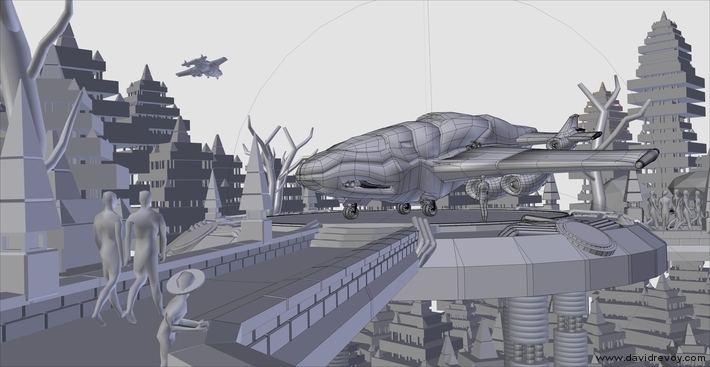 2 hours of videos - the main illustration done in this training is a big high-detail 6K picture of a science-fiction environment, with space ship, a city, plants and trees, and several characters. The real target of the training is to understand the 3D to 2D workflow. An open DVD ? why to buy it ? If you can't support, open project like this one will stop one day. The Blender Open Movie Workshop DVD series is a Blender Institute product. Think about it ; By purchasing this DVD you support the Blender Foundation projects, artist like me and the free culture. 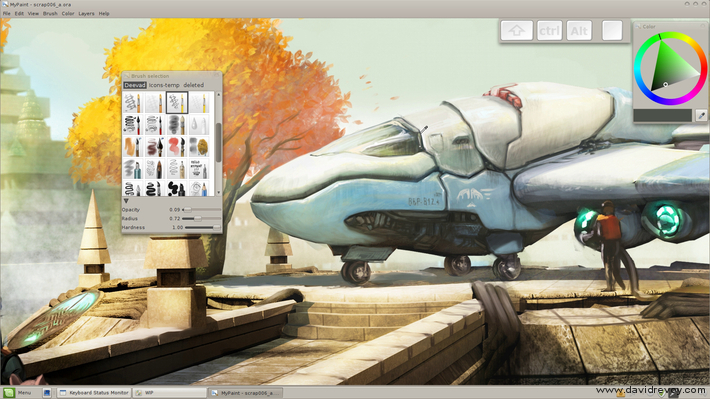 - a basic knowledge of Gimp-painter or any digital painting software is recommended. - DVD-Rom ; not meant for DVD player but for PC/Mac ; HTML menu, videos as *.avi files. - Short, concise steps, commented with english labels (no voice-over). Every DVDs link to this page. Use the comments of this blog post to ask your questions, or report issues, or post your artworks. Printing issue with the manufacturer : first batch of DVDs printed got short (8.3) names in Windows, Mac. A temporary HTML fix is available here for download now. 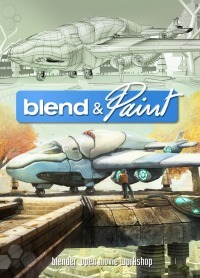 On any request to the shop, the Blender e-shop will send you a reprint for free. In the 'resources' documentation, 2 typos in the code to install all softwares were found ... too late. This code on Linux is also irrevelant now. Gimp 2.6 user : you'll need the plugin file-ora.py to open *.ora. 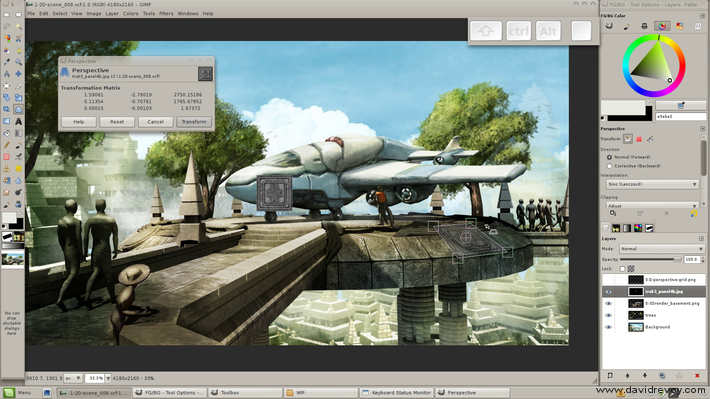 Gimp 2.8 user wont need it. This question were found on the youtube video comments posted above. Feel free to ask more in the comment part bellow this post. Q: What kind of program is used to create the "subtitles"? A: I use Kdenlive (http://www.kdenlive.org/) and the template titles engine (http://www.kdenlive.org/discover/0.7.5#template ). Q: I really want this..but i don't have a dvd player..
A: The DVD is a DVD-Rom , to read on a PC with VLC ; so you don't need a TV home dvd player. If your computer don't have a DVD player, feel free to download it ( a torrent will be surely available by the community soon after release) don't forget to support the Blender foundation with a Paypal donation (http://www.blender.org/blenderorg/blender-foundation/donation-payment/ ) if you think it worth it. Q: Doesn't anyone feel a certain element, or even a large chunk of the magic involved in creating , admiring and displaying, has been removed from the whole essence behind illustration ? Q: I would also like to know is there is a suitable BOOK, normal paper, that will teach me about thing s using the new blender interface 2.5? Q: I am a new beginner on blender and 3D world, and from the moment I realized that blender is a wonderful tool for my future work, I am interested to buy your video DVD blender and Paint. But, this is the question: I do not use MyPaint. I have another colouring software that I bought, and I was wondering if I still can follow your DVD instructions using my software. A: As a beginner, it will be a bit harder to follow it with OpenCanvas or Photoshop or Corel Painter. But the DVD present a workflow more than a real 'press this button' tutorial . So I think you can benefit from it. Q: Just wondering how much the 3d art is used in the end product. is it mostly for reference, or is it almost 100% traced? License: CC-BY David Revoy, www.davidrevoy.com, 16 march 2011 . @Trébla : ;) je savais qu'un des écrans de la vidéo allais te plaire. It's about time. I was wondering what you have been up to. Looking forward to sitting down with it. The last one was very good. Thanks Steven for the comment :) I will try to maintain my blog to show my progress with the DVD 'making-of'. No worry, I'm just giving you a little dig. At least you have been productive. It is hard for me to stay productive at times. Can't wait to see your new DVD. I want to buy all the training DVDs of Blender Institute like educational sources in my University... but when I come in the Blender's store I don't see the ManCandy DVD and Animation Characer (DVD's training 1 and 3) what happend to them? Do you know if the Blender fundation still selling them? @Erik90mx : Oh , surely those DVDs (ManCandy DVD and Animation Character ) are 'sold out'. 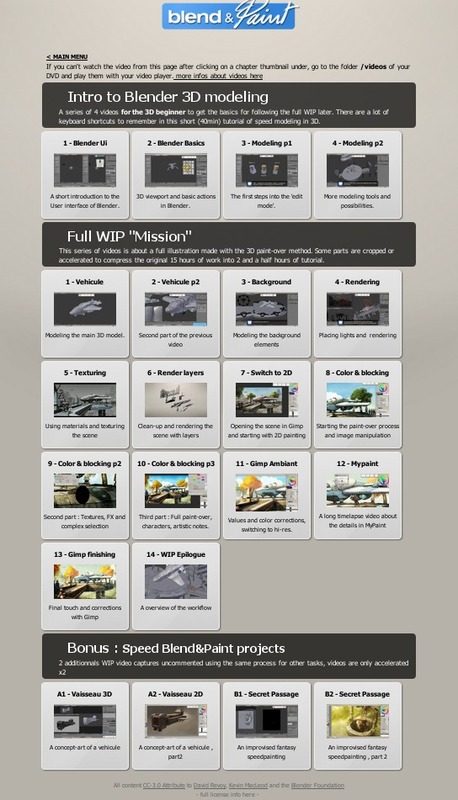 May be the Blender Foundation is just waiting printer to print it again, I'm curious to know. I will try to get fresh infos to the e-shop. Poke me in few day with a comment if I forgot to write here what's happen to them. I just finished the last checkup of the DVD, and now the final *.iso file and packaging files updload to the Blender Institute server. Time to clean folders and do a Blog post about those epic last days. Just received my copy of Blend & Paint and it does not work because all the file names are short 8.3 names instead of long names. I've tried 2 separate PC's. Is this just my copy or is there a manufacturing fault? Thanks for the DVD , and sorry if you have trouble with it. Here I just gave the raw files as archive file to the Blender Institute after succesfull burning one for me and testing on various system. I still not received my own copy from the printer/burner, and so I'm very interrested if a problem like this exist on the DVD , or if it's a copy specific. Be sure I contacted the Blender Institute for more info about it, and I wait the feedback (I will post here asap ). Just for information, what is your operating system ? I tried the DVD in two machines. Both Windows 7. One 32 bit and one 64 bit. I've also sent an e-mail to the e-mail address on the blender store site. I can't believe I am one of the first to receive their copy. I guess someone has to be first. I was looking forward to looking at it. @John C Brown : Yep, you are the first :) Thanks a lot for your informations. It's help a lot. The team at Blender Institute confirmed the technical problem in all DVDs printed , Blend&Paint DVD 7 as well as Blenderella DVD 6. The problem only happen to Windows system. On linux and mac it's ok. The team is looking and working right now on the solution. I will keep update my blog about. Btw, even if the menu is not working, you can still access all the video courses on the "videos" folder of the DVD. Yes, the videos work but it is difficult to know which order to watch them in. The file names and the order do not correspond. e.g. 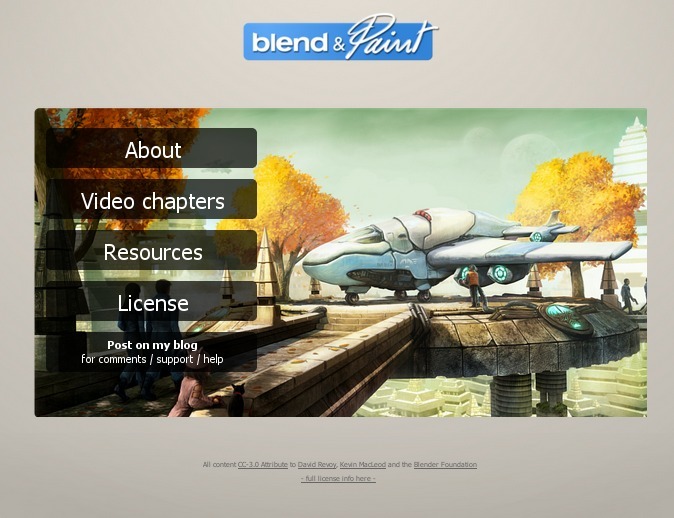 BLEND000.MP4 comes after BLEND001.MP4 and neither of them are the first one! Any chance you could do a chart or script showing the correct file names against the 8.3 file names? @John C Brown : Thanks again for report and for your patience ; as you can read in the last blog post ( http://www.davidrevoy.com/index.php?article75/ ); the Blender Institute work actually on a solution ; you 'll have at first an alternative menu to download ( 1.6mo ) working with your DVD ; the link comes soon. You 'll can also ask a new DVD at the Blender Institute in reply to your order confirmation e-mail. For the video order , I will update the post ( http://www.davidrevoy.com/index.php?article75/ ) and try to sort them considering the 8.3 renaming. I have received my copy 5 minutes ago, so now i have to wait till night to see it. 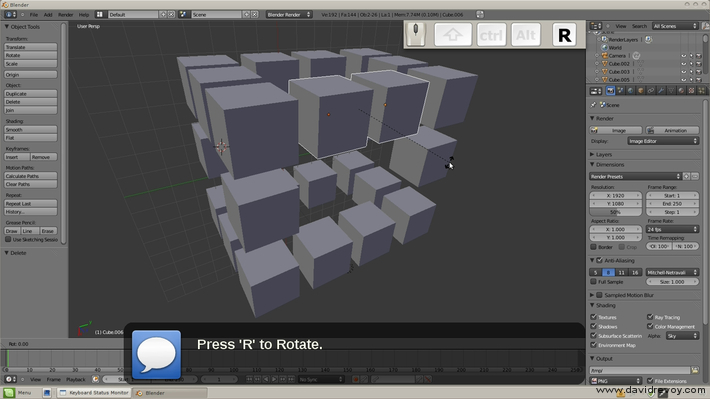 My attempt to learn blender.for 2d purposses. which i think is a very powerful resource. Sorry again about it, and thanks to report it, I will update my Erratum list. A ce qui disent que l'ont peut pas faire grand chose avec les logiciels libres, voilà LA REPONSE !! Thanks for this great videos. Looking at *-02 between minute 14 and 15 there are the delete part also coming back. Instead of showing how to manipulate objects with keystrokes, instead one sees many objects being deleted. Blender-04-modeling2 also has a video bug. When applying the bevel modifier we see the mirrored object again 5:05. Sorry again about it, and thanks to report it, I will update my Erratum list. Thanks for your comments. @Ben : Thanks for the feedback ! This is super convenient, I haven't watched it yet since I'm primarily focusing on boosting my skill at raw 2D artwork right now, namely painting and drawing. But since i'm into game developemnt I've been thinking right from the start if it wouldn't be a good idea to learn to create 3D models and use them as reference when I want to create something very specific. I bought this DVD for a few years now. I ripped the content on my External Hard Drive so that I can have a shot at it easily. I'm always stunned. Brightful colors, so pure lines in the drawings... As I said I knew the final picture for years. 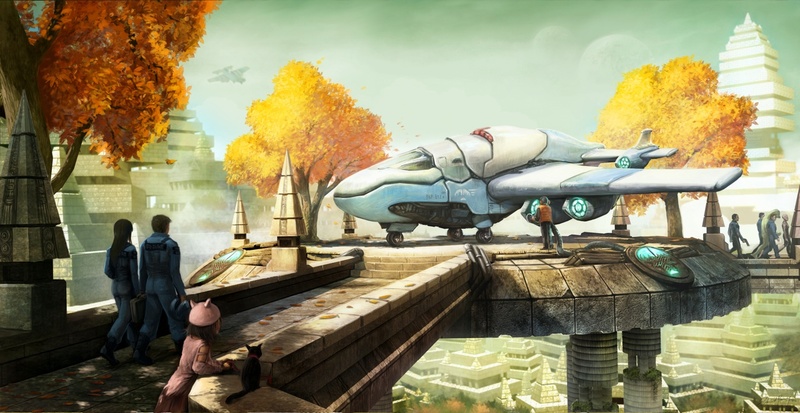 The great spaceship laying on the hitech landpad, trees in their autumn theme, sci-fi houses, the familly on the left side ... but until today I had never noticed the lezard prisonner surrounded by scifi policemen on the right on the way out of the cargo plane. Wonderful scene. 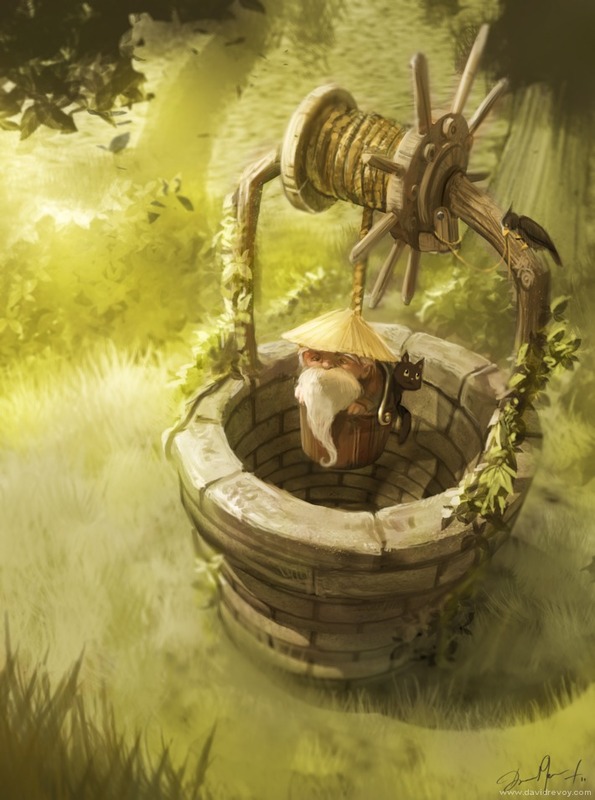 It's been made as a project for a video game ? Is this lezard a famous crook in some universe ? @One more POV (who cares?) : Hey, thank you. With the rapid grows of Blender, Gimp-painter almost disapearing and Mypaint changing totally of interface ; I feel Blend&Paint always as my probably most outdated DVD, even if Chaos&Evolutions is older. This scene was a bit random, but I always like to add 'narrative elements on the corners. It's a composition tip a painter told me once ; adding narrative small design or elements on the corner of painting , as secondary 'plot lines' from the main centered topic always helps to make the piece more interesting. So, I built this little scene for fun. 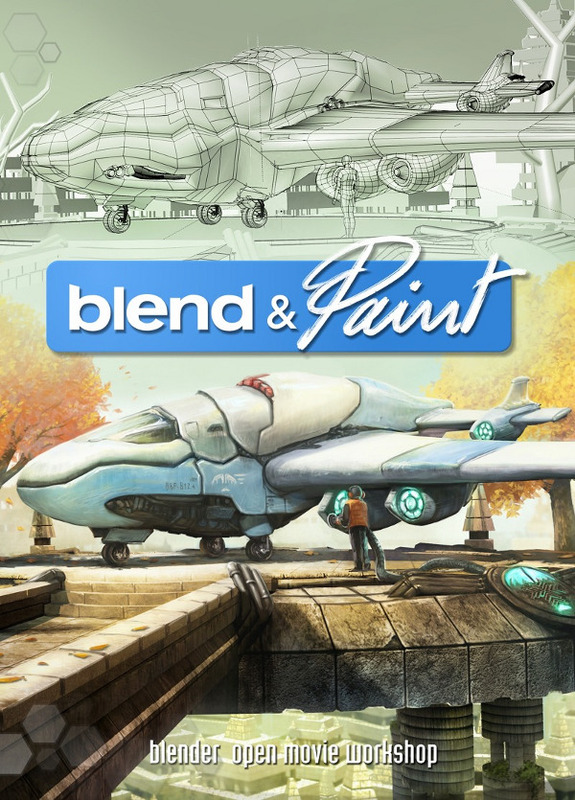 Thank you for your support with the Blend&Paint Dvd ! I study the modeling of the spaceship more closely. In WIPmission-01_modeling-part1.mp4 at the 4th minute you select 4 faces and apply W, Smooth 3 times on the selection and while modeling the wing (pteron in greek as I've just read) at 5min40sec you do it again. Those faces are small areas and are almost concealed in the whole model so why ? Maybe I don't understand the use of W Smooth. Can you give me an explanation ? Oh, I see here : https://youtu.be/DWpggsk852k?t=4m3s , I think I do this smooth on this little surface to flatten it a bit, because I extrude it just after. True, this type of little details probably are useless because it's easier to add them on the paint-over. I think it's just part of the fun and pleasure to model. I followed with care (my own meaning of "with care" ahem...) the modeling of the WIP spaceship but I won't be able to perform a model as nice as yours. There's always a budge in the global shape and it becomes even more difficult when you model the booster and its mechanics. I think I will let down the Mission. All is available in preexisting files after all. The problem is that if I don't recreate what has already been created I don't go very far in the process. Without my own model I don't know why I should texture it thus I don't feel like watching the texturing part of your tutorial. 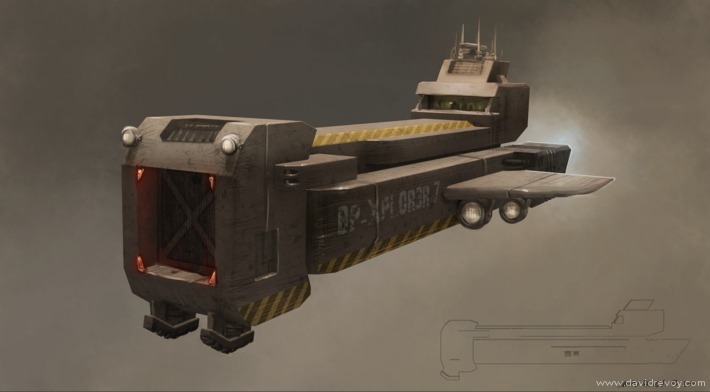 Creating a brand new spaceship with a platform and its surroundings. @Samuel : Hey Samuel, I'm impressed ; you really put a lot of time into it. Good luck ! 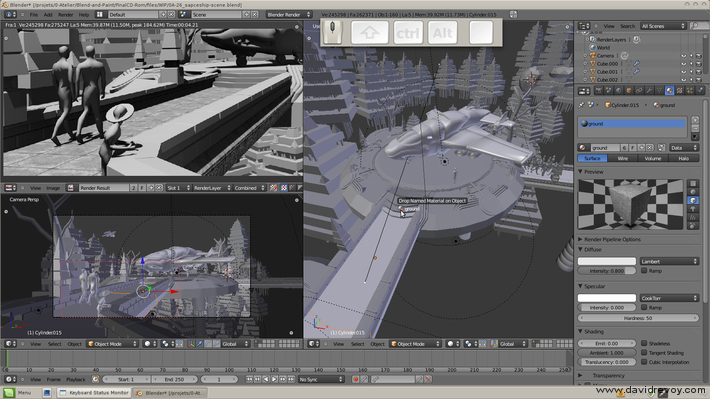 Modeling 'speed' 3D scene is fun. You can also import model ready made from http://www.blendswap.com , and get fun with the proportions.